Quickly move windows between monitors or maximize a window to the desktop using the additional window buttons added by UltraMon. On Windows 8 and later UltraMon extends the built-in multi-monitor taskbar with additional features. On Windows 7 and earlier a taskbar gets added to each secondary monitor, and each taskbar only shows tasks from the monitor it is on. This makes managing lots of open applications much easier, and when activating an application, you'll know on which monitor it will appear. Use the UltraMon tabs added to a shortcut's properties to set an application's position or use custom display settings when the application is running. The UltraMon wallpaper manager adds the ability to use a different picture on each monitor, or stretch a single picture across the desktop. Some screen savers only run on the primary monitor. UltraMon can blank the secondary monitors when the screen saver is running, or run additional screen savers on secondary monitors. Mirror the primary monitor on one or more secondary monitors, for example when doing a presentation. Or mirror only a single application on a secondary monitor. A unique feature is support for different resolutions, the source monitor can run at a higher resolution than the mirror monitor. 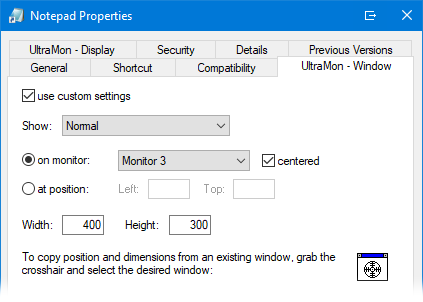 UltraMon provides a custom Display Settings applet with support for configuring more than 10 monitors. You can quickly configure even large numbers of monitors using the included monitor arrangement tools. These are only the main features of UltraMon, for detailed information, take the Feature Tour.